Eye On Tampa Bay: Another apartment? Who cares? What's the big deal? Do we want more renters? The way the Tribune stenographers take dictation from the urbanistas you'd think the only place people are moving are into apartments near downtown Tampa. We'll check some public data sources to see what's really happening in Hillsborough County and city of Tampa. First stop, lets check home sales in Hillsborough County. Be sure to note difference in the scale on the left y-axis. 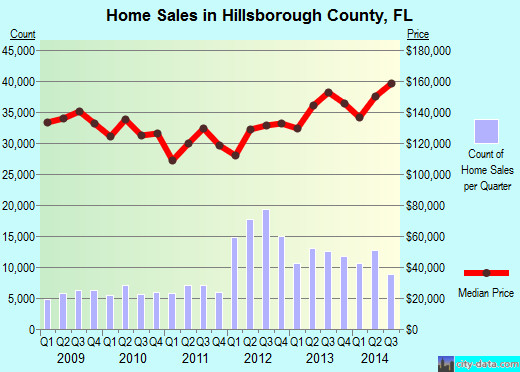 Eyeballing the charts, between 2009 and 3Q2014, Hillsborough County quarterly home sales have run between 28,000 and 40,000 units, and Tampa between 2,600 and 4,600. Even subtracting the Tampa sales from the Hillsborough sales, Hillsborough is moving 7 - 8 times the housing sales as Tampa. 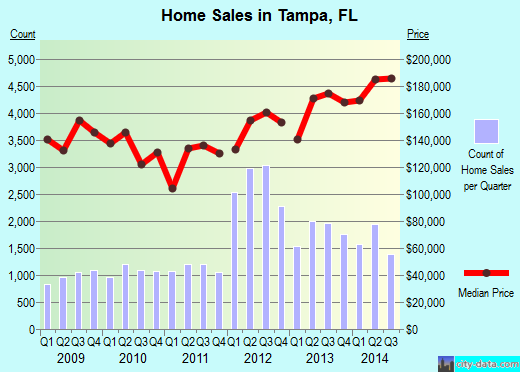 The vast majority of people are not settling down and buying homes in Tampa, but in the county. Next stop, lets check building permits, starting with 1Q2015 numbers. Note: Figures above represent all new construction excluding demolitions, remodeling, additions and any alterations to existing buildings. Source: Hillsborough County City-County Planning Commission. Might as well check the Q42014 numbers while we're at it. Note: Figures above represent all new construction including demolitions and excluding remodeling, additions and any alterations to existing buildings. As the numbers above show, unincorporated Hillsborough County continues to be at least 5 times more single family development than Tampa. Even adding in the apartment numbers, where Tampa somewhat closes the edge, the county is still leading the development over Tampa. This is no surprise to anyone who's lived in the area for a while. This just confirms the existing trend, since practically all the growth in Hillsborough over the last 30 years has been in the unincorporated, not in the city of Tampa. And the trend continues. Is our future one of more apartments and renters, or do we want more homeowners? Why are the homeowners buying predominately in the county? Another questions, while we're in the mood. Is anyone else concerned about the impact on our roads, water and sewer infrastructure when a neighborhood block is rezoned from 6 - 12 homes per acre to 200+ apartments? Increased density on rezoned or infilled properties in the Tampa have significant impact on our infrastructure, just as single family homes in the suburbs. Density begets congestion. Been to South Howard lately? Do we really want more like that? Is it too much, too painful to ask and confront this reality? But the Tribune won't ask. They'll just continue to shake the pom-poms for the Tampa urbanist interests, while people in the real world make real world decisions on where they live, and the inconvenient truth is that it is in the suburbs.